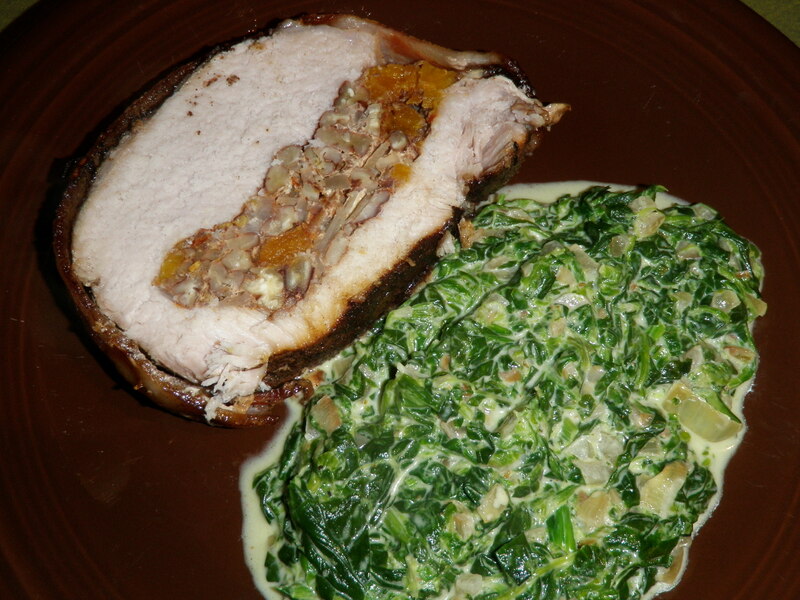 If you are a fan of my creamed spinach, you will LOVE this dish! My friend Rebecca is just starting her paleo journey and came up with this. I tweaked it a little for my own preferences, but I’m so thankful she gave me the idea for this. It was super tasty. 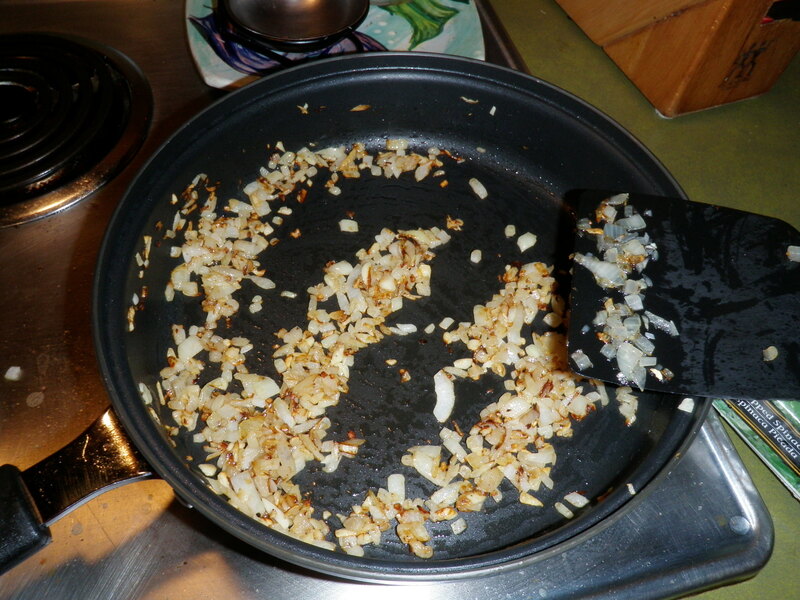 Cook up the bacon bits in a pan on medium high until crispy. 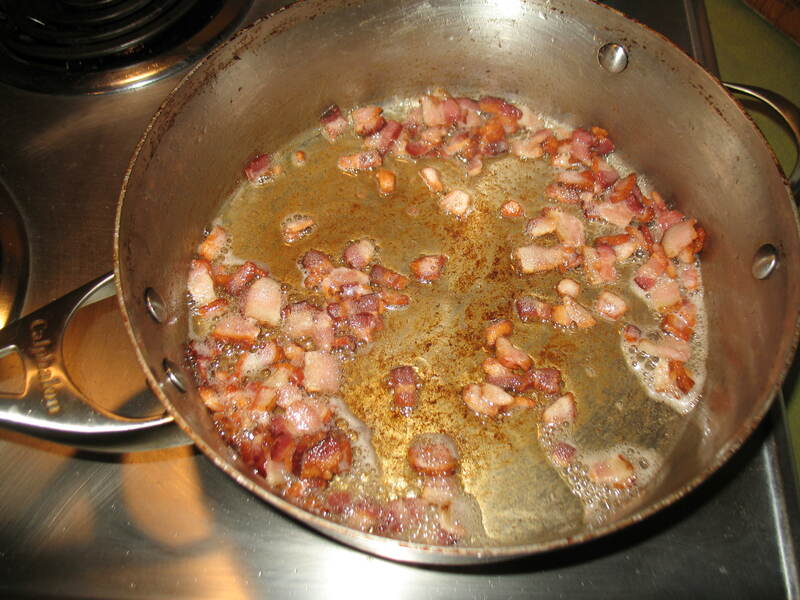 Remove bacon and keep the fat in the pan. 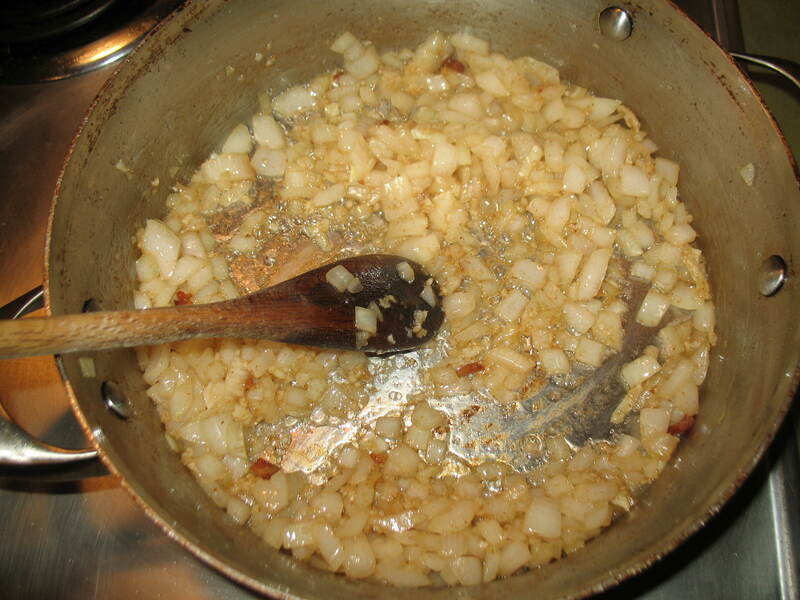 Add the onions to the pan and sauté until they start to soften. About 3 minutes. Add the garlic and cook for another 2 minutes. 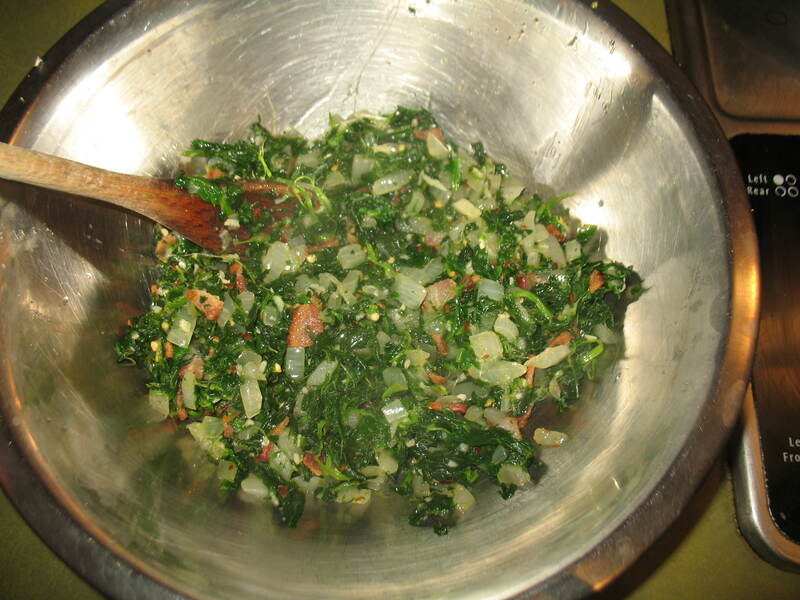 Add the spinach and red pepper and toss the pan a few times until evenly distributed. Remove from heat and add to the bacon bits. Mix and set aside to cool. 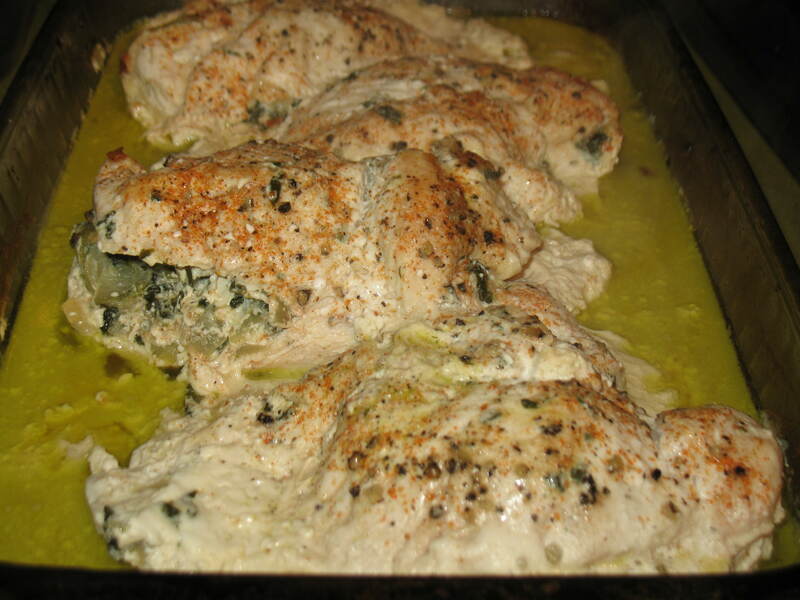 While your spinach cools, slice your chicken (pterodactyl) breasts in half making sure to keep one side still attached. If you are feeling particularity skillful try to only cut from the top so you have what is essentially a chicken breast mitten. 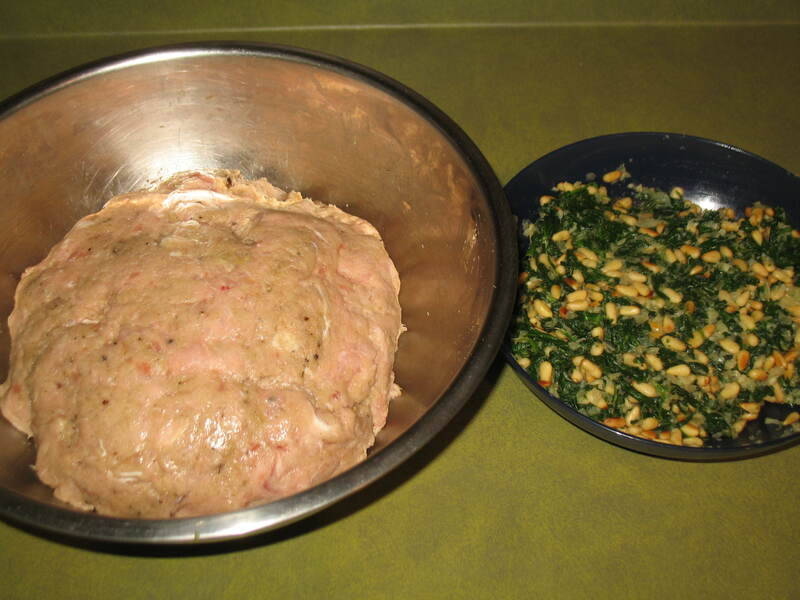 When the stuffing is cooled enough to handle, stuff the breasts with the spinach mixture. 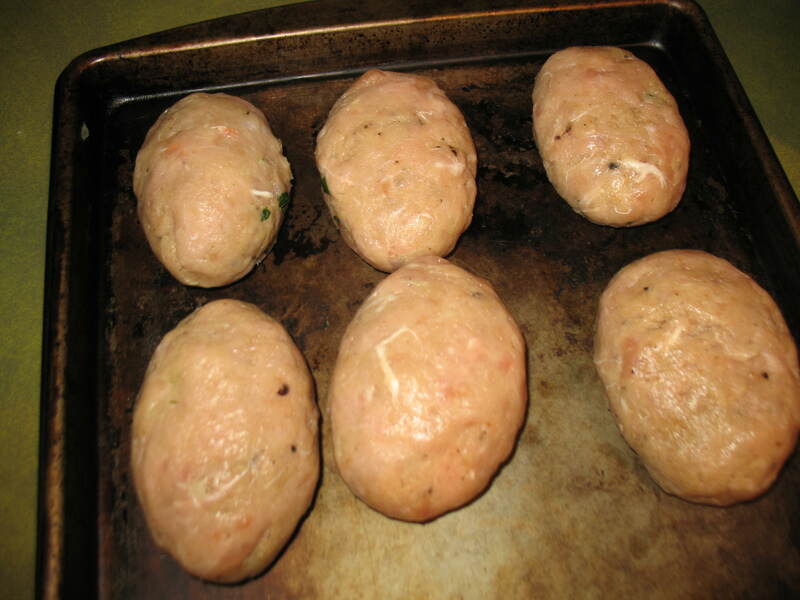 Place them in a well oiled baking dish. 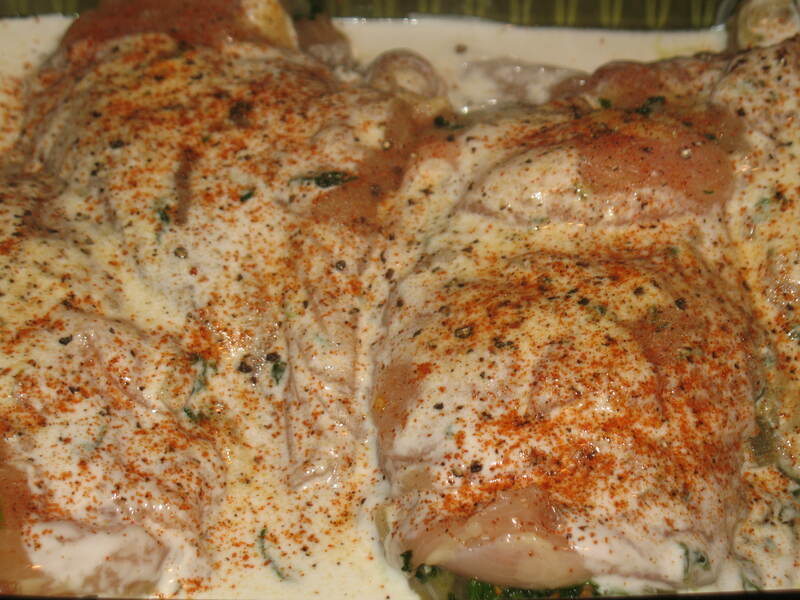 Pour the 1/4 cup of coconut milk on top of the breasts then season them with your remaining seasonings. Bake covered in an oven at 400 for approximately 45 minutes. Check with a thermometer that the internal temperature is 180. 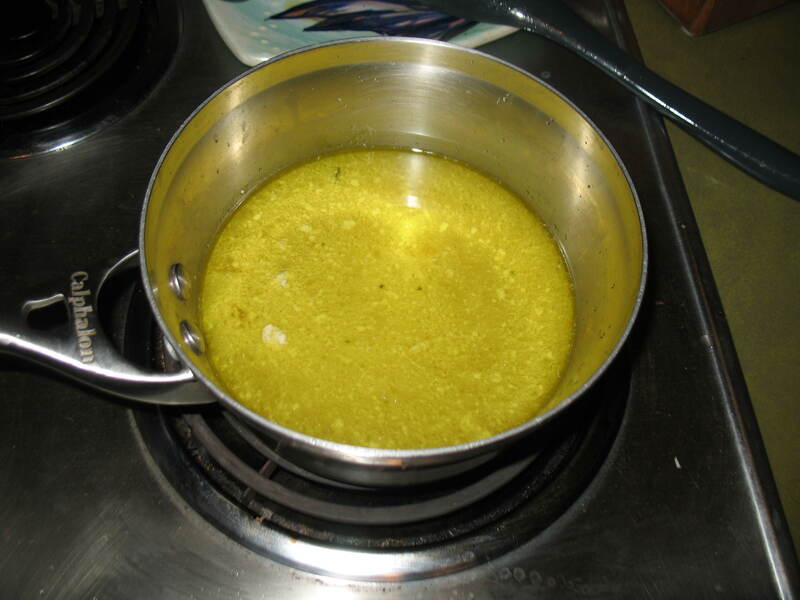 When done pour out the pan drippings into a stock pot, turn temperature to medium high. Add the remaining coconut milk and xanthan gum. Whisk until the mixture begins to thicken. 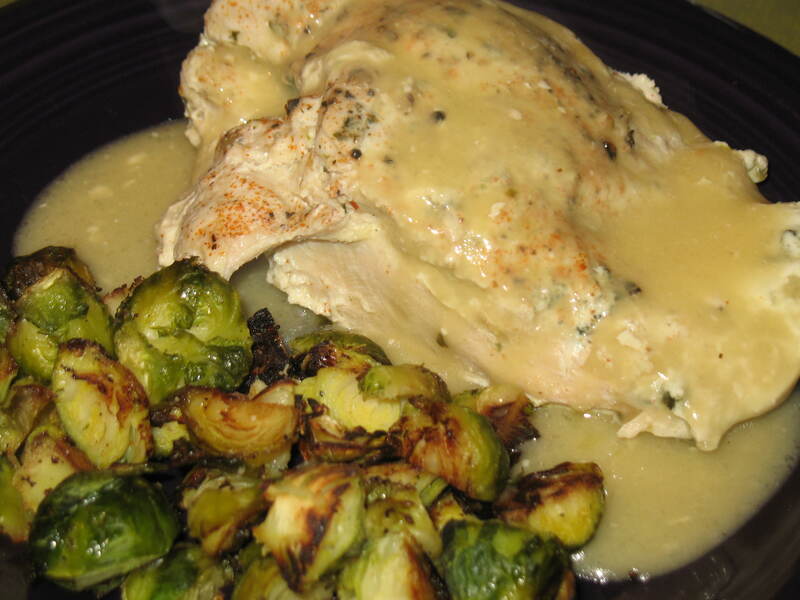 We ate ours with roasted brussel sprouts. I love brussel sprouts and noticed they were super cheap at the store in frozen dinner sized packs so I bought a few. Apparently I thought this was a good deal last week too. We now have a LOT of frozen brussel sprouts. T told me not to buy any more for awhile. Ooops. This meal is so amazing! Try it today. 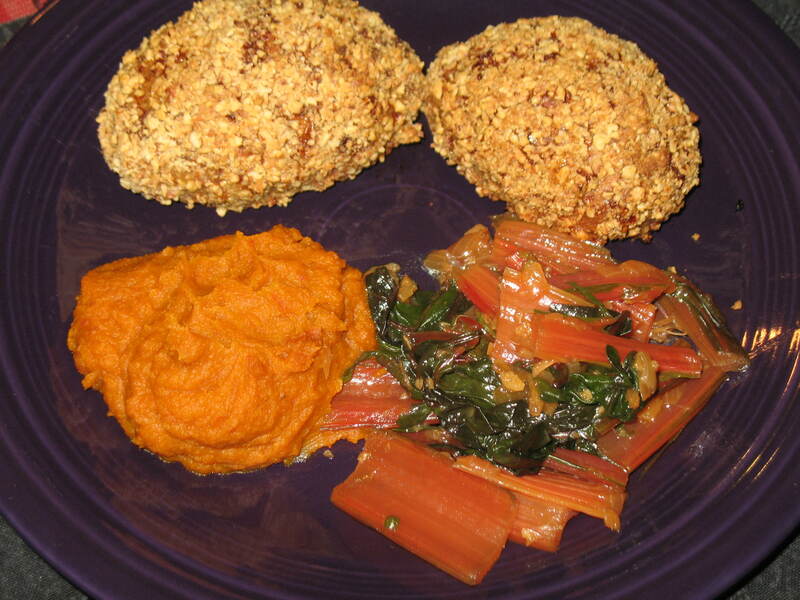 In Wednesday’s post I said I made a variation of this recipe for dinner. If you are interested here is the variation. 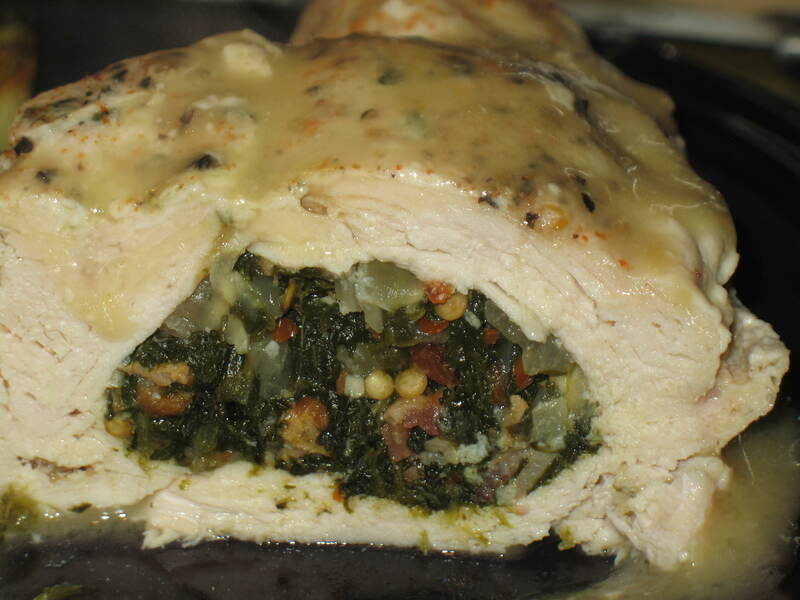 I’ve made this a few times with tweaks to the seasoning and filling. 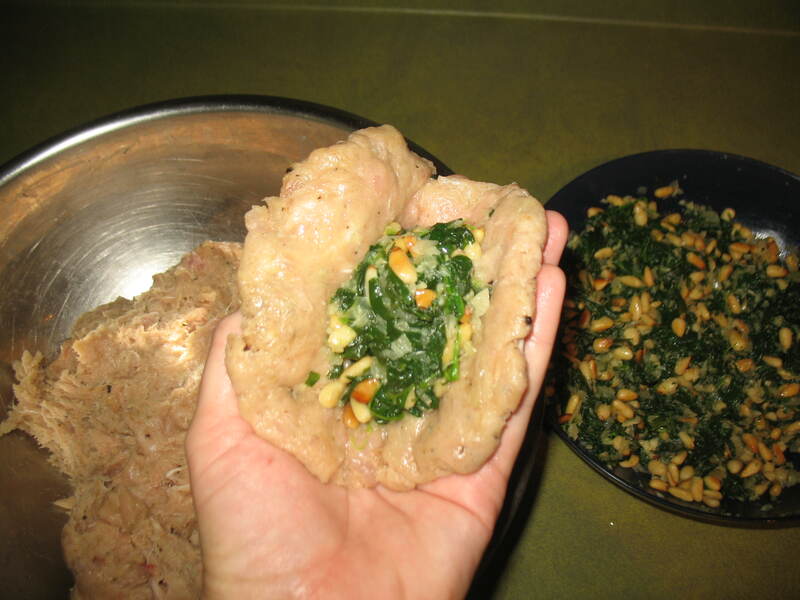 Essentially it is a meat paste with seasoning, green filling with nuts, and a nut flour crust. The preparation is time consuming so it is not a good week night meal. However, it freezes well so make a bunch and freeze in batches for when you want them. I served this with a coconut milk mint raita. Raita is an Indian sauce used to cool down spicy foods. With a little whipping in a food processor and some xanthan gum the coconut milk thickened up just like yogurt. I added fresh mint for flavor. I put about 2 lbs of pork loin and 1 lb of chicken thighs into a food processor and blended until it made a paste. I know it sounds gross but when you’re done it won’t be. I added garlic powder, coriander, onion powder, ground ginger, salt, and black pepper. I didn’t measure the seasonings but if I had to guess I’d say about 1tbs of everything then adjust from there. I made a test patty to make sure the meat wasn’t dry or without flavor. 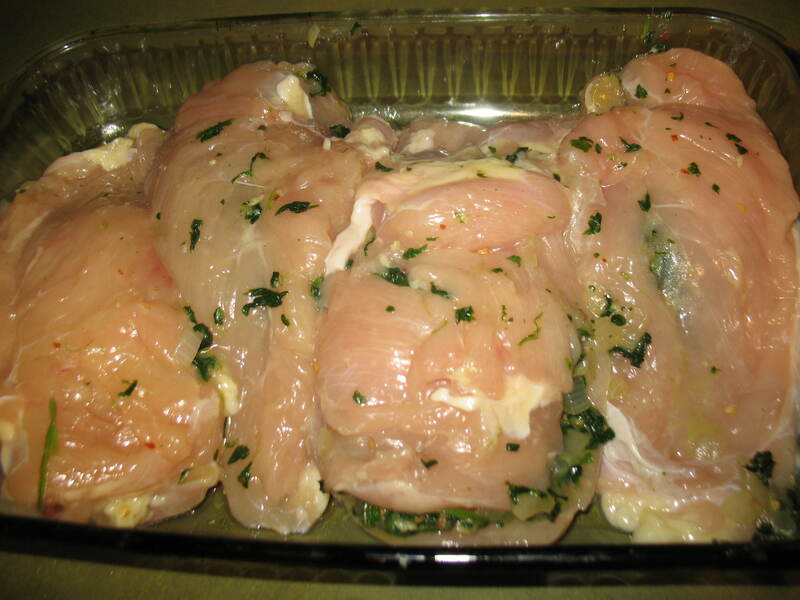 With pork loin if there is not enough fat the meat will be dry which is why I added the chicken. 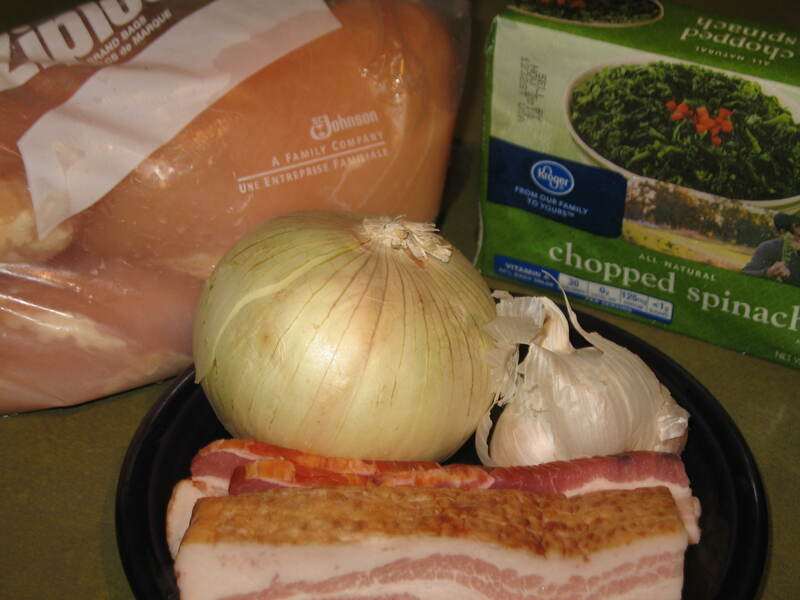 You can also add bacon fat or trim fat off another cut of meat. Refrigerate the meat paste for a few hours. This allows the flavors to mingle and the meat to rest. While that chilled, I sautéed a minced onion with ~4 cloves of minced garlic in some olive oil. 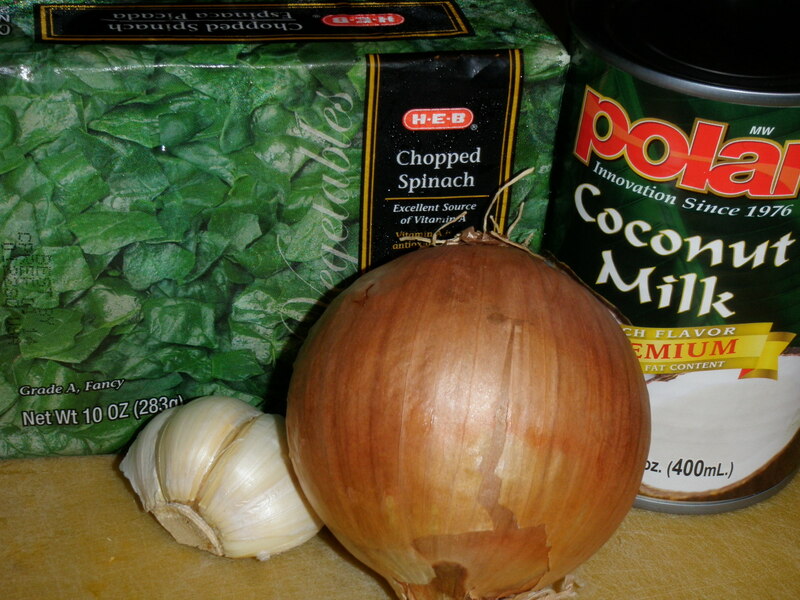 When the smell became less pungent and the onions started looking clear I added a frozen block of spinach. I’ve found that cooked spinach is better than fresh because the fresh loses so much volume when in the oven. Cook until the spinach is no longer frozen, then pass a knife thorough the spinach a few times to break any larger leaves apart. Set this to the side in a bowl. Using the same pan, heat some olive oil and brown about a cup of pine nuts. Keep an eye on them because they go from tan to black very fast. When the pine nuts are browned add them to your spinach. 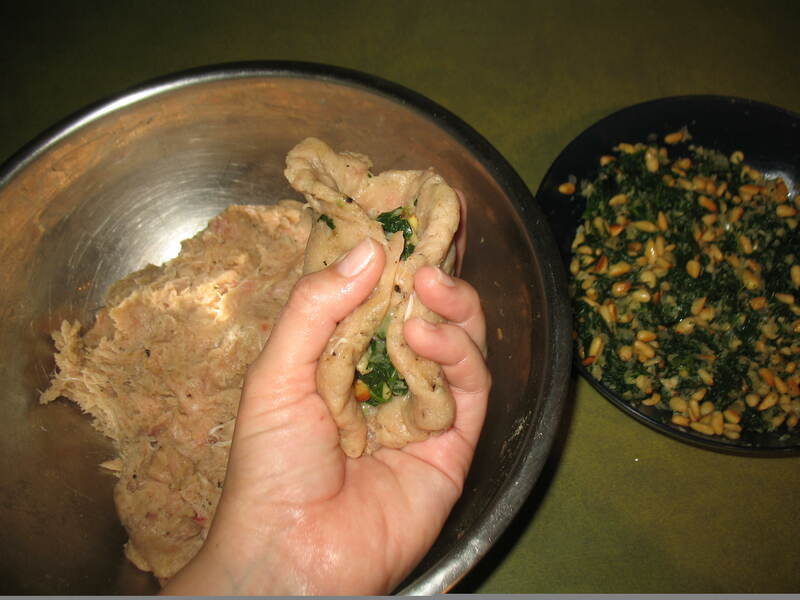 To stuff your kibbeh take a small chunk of meat roll it in a ball then flatten it out to a pancake size patty. In the middle add some spinach mixture being careful to keep it from the sides of your pancake. I keep a bowl of water nearby to rinse my hands in between spinach applications. Fold up like a taco and pinch the sides of the pancake smoothing and rolling out any seams. The seams will open up in cooking if you don’t take care to do this step. When you’re done your meat will look like a foot ball. You can play around with the size of these but my favorite is about the size of my palm. Continue until all your meat is used up. In a food processor or blender blend almonds and unsweetened coconut shavings until it resembles a fine meal. If you have coconut/almond flour you can use that too. I like the slightly crunchier texture of making it myself. Set up a bowl with whisked eggs and another with some of your almond coconut mixture. Dip a ball in egg, then roll in the nuts, place on an oiled cookie sheet, and repeat. When all your balls are coated with nuts bake in the oven at 350 for an hour. Give these a try and play around with the ingredients. I make them different every time and they are always very tasty.